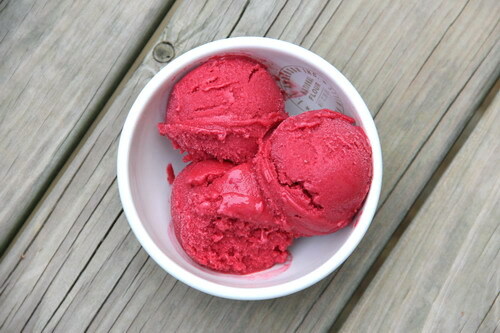 Do you call it sherbert or sherbet? I’ve always called it sherbert. I only just this year found out there is only one r in the word. Odd, at least to me. Regardless of how it’s spelled, it’s yummy and one of my favorite frozen treats. I realize many are quick to rush into the deliciousness of the months ahead and believe me I’m SO ready for it but… it technically is still summer and many areas of the country are still experiencing hot temps so let’s have one more fruity frozen treat. Of course it could be made and enjoyed year round but typically ice cream makers are churning away in the hot summer months. 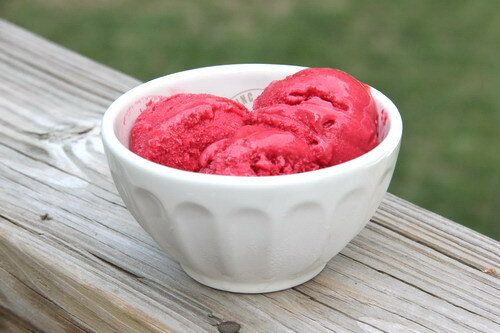 I was determined for my first homemade sherbet to be raspberry, simply because I had a nice frozen stash of raspberries. I like when I already have ingredients on hand for something and they won’t go bad while waiting. The key was getting the milk (if using whole milk, but I don’t feel it’s totally necessary) and using it before it went bad. I’m really bad at remembering what dairy items are in the fridge and using them before they’ve spoiled. Regular milk and cheeses, not a problem but when we’re talking special milks and creams… forget it! I’m pretty sure I went through at least one small container of whole milk before getting around to making this. I swear these items need timers on them. A giant countdown clock reminding me when something absolutely needs to be used by. It’d make life so much easier. Yeah I know, they have those handy dandy little markings with ‘use by’ and ‘best by’ but they’re so tiny and not flashing in my face. Sometimes you even have to hunt for where it is on the container! I was beyond thrilled when the moment came where I remembered to pull out the ingredients and whip this sucker up. It was totally worth the wait. If you’re a fan of raspberries, this is an absolute must make. The best part is that you don’t have to wait until raspberries are in season again since they can be easily purchased frozen! I love raspberries for that reason. They’re always available. I wish the same could be said of apples but that’s another gripe for another day. 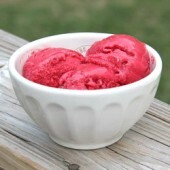 This recipe originates from The Perfect Scoop by David Lebovitz. I highly recommend picking up a copy if you are new to making frozen treats or just looking for a new addition to your cookbook collection. It’s fantastic and has so many possibilities, all very simple. The recipes states that it will make 1 quart, however I trimmed the recipe down to 3/4 and still came out with 1 quart of liquid. I’m sharing the trimmed down recipe, simply because you can easily find bags of frozen raspberries to equal the quantity needed. Thaw raspberries until at least soft. 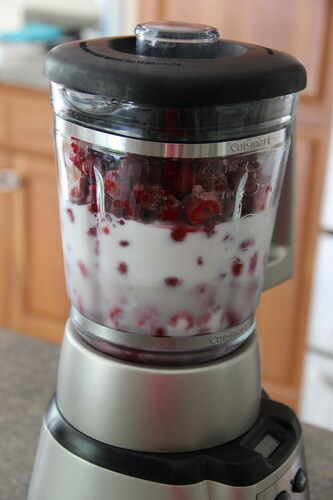 Add raspberries, sugar and milk to a blender or food processor. Blend until smooth. Over a large bowl, pour mixture through a strainer to remove seeds. Discard solids. Stir in lemon juice. Add to ice cream maker, mix for 25 minutes or per manufacturers directions. Transfer to a freezer safe container. 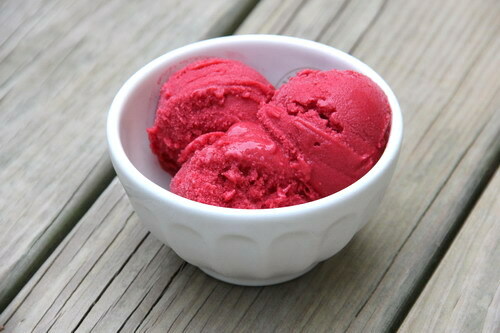 Freeze for at least 4 hours or until sherbet reaches desired consistency.